We had a brief stopover at the City of San Fernando in La Union, a 2-hour drive from Baguio City in the Philippines. My wife spent a considerable number of years working here, and so she wanted to see some friends before we left for Manila. Incidentally, this was also where the airport was located and we were bound for a flight to Manila there, so it was quite a convenient stop. One of Tina's friends gave us a basket with a beautiful piece of cloth hiding the contents therein. I did not know what was inside until we opened it up in Manila. It's Cornick! 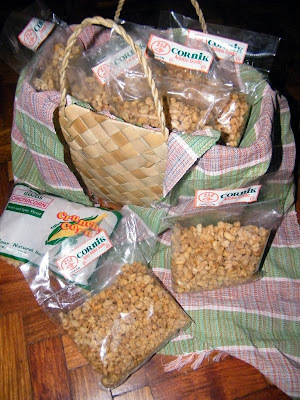 Cornick is the Filipino's answer to the American's Corn Nuts. 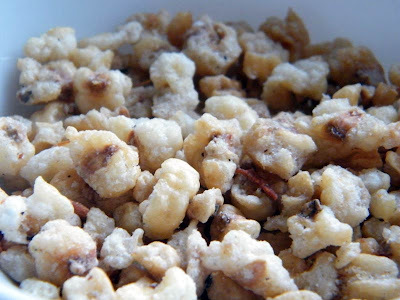 Cornick is garlic and salt-flavoured, deep-fried cork kernels. And based on this goody basket, it now comes in different flavours too! I like the adobo garlic best. There's also the sweet and the spicy variety, which are just as great. Its street name is chichacorn and is a popular product from La Union and the Ilocos region where corn is a staple produce. The great thing about this product is that you can bring it along as pasalubong! It was cleared by the NZ Environmental Agency. We gave some to friends, which they delightfully accepted and opened almost simultaneously. It's amusing how one can have a bag of Cornick around when chatting with friends and realize later on that it's nearly gone! Cornick has a crafty way of disappearing like that. Which is just as well, because if kept in the open too long, it loses its crispiness. If there's any left at all!